OKTOBERFEST BIER HALL & OOMPAH PARTY! The Beer Merchants Tap is bringing the Oktoberfest to end all Oktoberfests to Hackney Wick. Our sister company, Cave Direct, has been importing German Lagers for over 40 years and this year we’re bringing them all under one roof! Our ‘Oktoberfest Bier Hall’ is launching on Friday 21st September and will last for six whole weeks, all the way through October closing on Saturday 27th. Throughout the event Steins (two pints) of Paulaner & Hacker Pschorr will be available for £12, served with a delicious freshly baked pretzel from The German Deli. Friday 5th October however will be the BIG NIGHT! 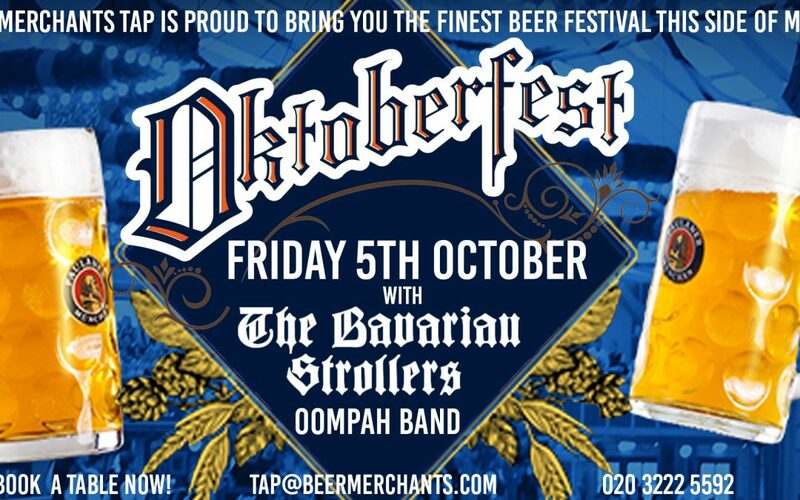 We are very proud to have The Bavarian Strollers, one of the UK’s top Oompah Bands, performing throughout the night at the Tap! YOU MUST HAVE A TICKET TO SECURE A TABLE IN THE BEER HALL WHERE THE BAND WILL BE PERFORMING! Tickets include your first stein of beer & pretzel, and table service all night long! We will be reserving tables for parties of 6-8 on the night. Email tap@beermerchants.com to reserve your table now!